The Rum Shack is a Caribbean bar, canteen and music venue in Glasgow's Southside. After working with the team previously on branding and promotions for their street food venture, I was asked to work on the company branding, menu design and some illustration work for the bar's interiors. Working closely with one of the founders of the company who has family from Trinidad & Tobago, we delved into Caribbean culture and West Indian folklore to create a brand style and a series of bespoke illustrations that reflected the heritage. The bar has become an immediate success in the Southside of Glasgow, serving Authentic Caribbean food and hosting events ranging from stand up comedy gigs, theatre performances, artisan markets and community based events. Find out more about The Rum Shack on their website. Working with the company owners I researched mythical characters from Caribbean culture and West Indian folklore. Several characters and visual culture were the basis for the bars bespoke interior artwork. 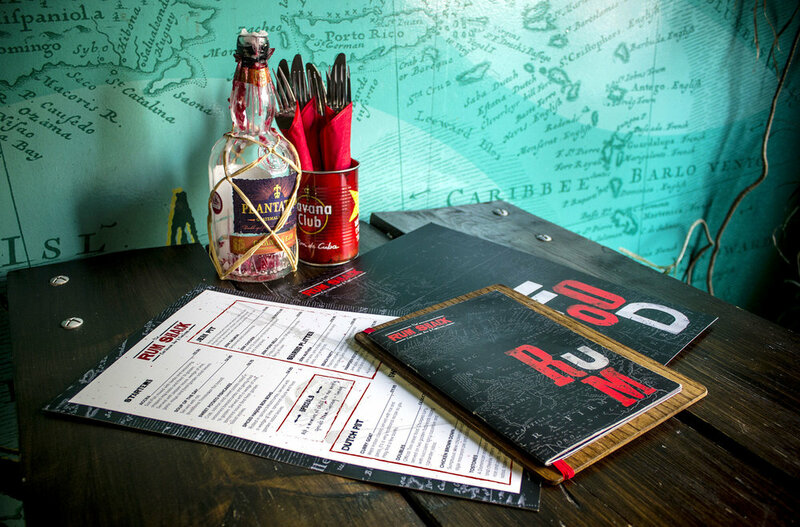 By searching for old maps of the West Indies and the Caribbean, we created a 17ft wall vinyl as a feature for the main dining area of the bar.